Since it’s just the two of us, the pesto salmon recipe left with at least a pound of excellent baked fish, much too nice to go to waste. I have never really been able to get excited about the very Pacific Northwest combination of salmon and scrambled eggs, so I decided to look for other inspiration. My first thought was a salmon chowder, but Jeremy isn’t a huge soup fan, and I didn’t really want to eat chowder all week either. I decided on salmon croquettes, and they did an admirable job of using up all that leftover fish. My recipe was based on one from New York Magazine, but adapted for use with fresh salmon rather than canned. 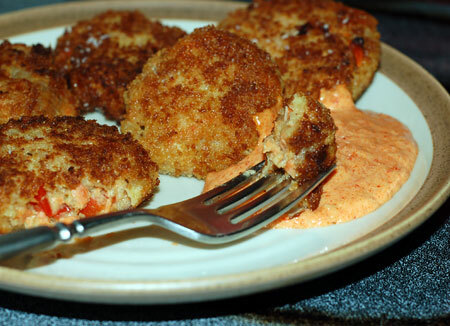 I also added a bit of chopped red pepper, and since I needed to roast peppers for white bean dip anyway, I whipped up a little roasted red pepper aioli to accompany the croquettes. Jeremy seemed satisfied with the croquettes, but commented several times on how good the aioli was. Place the salmon in a large bowl. Heat the butter in a nonstick frying pan over medium heat, add the onion, garlic, and pepper, and sauté until soft. Stir in the 4 teaspoons flour using a wooden spoon; when the flour and butter are combined, slowly add 1/2 cup milk, stirring to prevent lumps from forming. Bring the sauce to a simmer and cook for 1 to 2 minutes, until thickened. Pour the sauce over the salmon and stir until all the ingredients are combined. Season to taste with salt, pepper, Old Bay, and Worcestershire. Stir in the mayonnaise and about half a cup of bread crumbs, cover the bowl, and place in the refrigerator for 1 hour. With the palms of your hands, form the salmon mixture into small patties, about 1-2 inches in diameter. Beat the eggs in a bowl, put the remaining milk in another bowl, sprinkle 1/2 cup flour on a plate, and spread the remaining bread crumbs on a cookie sheet. Quickly dip each croquette first in the milk, then in the flour, then in beaten egg, and finally coat with bread crumbs, making sure each croquette is completely covered with bread crumbs; set on a tray. It will be less messy if you use one hand for touching the dry dredges and one hand for the wet. Heat the oil in a 10″ cast iron skillet over medium heat; there should be enough to cover the bottom of the pan around 1/4″ deep. When the oil is hot, place 6 or 7 of the croquettes in the pan and sauté for about 3 minutes on each side, or until bread crumbs turn golden. (Make sure the oil does not smoke and discolor or the bread crumbs will burn.) Place the croquettes on paper towels to drain; sprinkle with kosher salt while hot. Serve warm with roasted red pepper aioli. Source: Adapted from New York Magazine. In a bowl, combine the peppers, garlic and mayo; use a stick blender to puree until almost smooth. Season the aioli, to taste, with salt and pepper. This can be made 2 days ahead. Cover and refrigerate. Giada recommends this on garlic bruschetta with a seafood boil. Source: Adapted from Everyday Italian, with Giada de Laurentiis. Living in the Seattle area, I can always use a new salmon recipe….looks yummy. Thanks, Peabody! Down here in Salem, we eat salmon a lot too, so it’s nice to have options for leftovers.